I’m a little obsessed with Rice Krispie Treats! That combination of gooey and crunchy gets me every time! They’re the perfect treat to bring to a party because, really, who doesn’t love them? 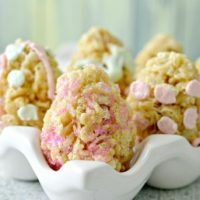 Usually people just make them into squares but here’s a really pretty way to present these treats for Easter – Easter Egg Rice Krispie Treats! 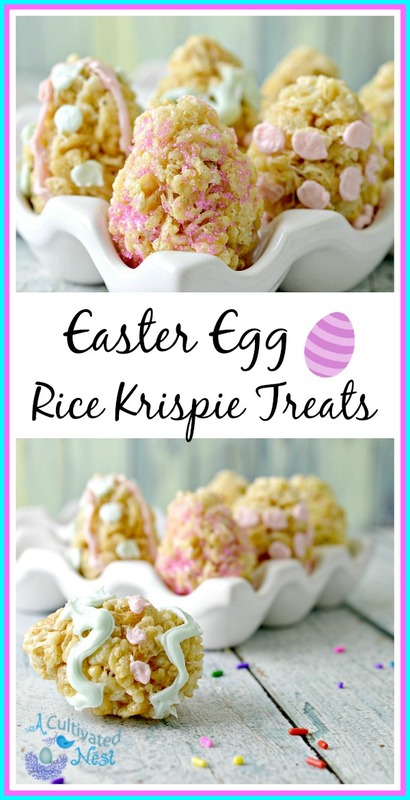 This Easter Egg Rice Krispie Treat recipe is quick to make and only needs a few ingredients! 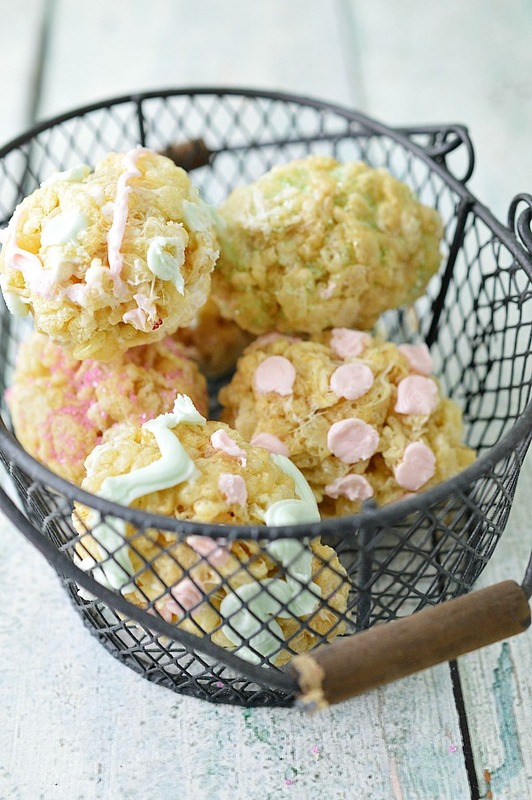 Both kids and adults will enjoy these gooey treats! 1. In a large bowl, place together the butter and mini marshmallows. Microwave for 2 minutes or until the butter is melted and the marshmallows are puffy. 2. Remove from the microwave and stir in the cereal. 3. 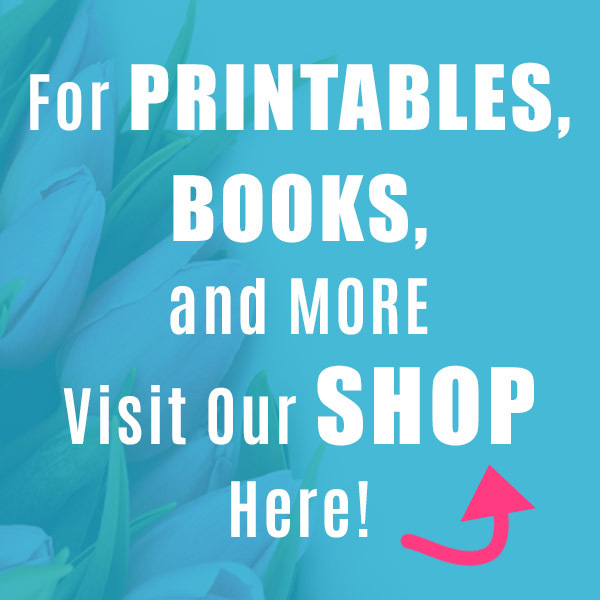 Let the mixture cool for one minute, place a bit of butter or baking grease on your hands and shape the cereal into egg shapes or spray the inside of a plastic snap-apart Easter egg and use that for a mold. 4. If you want to decorate using some cute spring sprinkles, make sure to place the sprinkles while the marshmallow treat is still warm so they stick. To decorate with frosting, wait until your egg shapes have cooled for a few minutes and then get creative with your designs! They are best if enjoyed the same day. 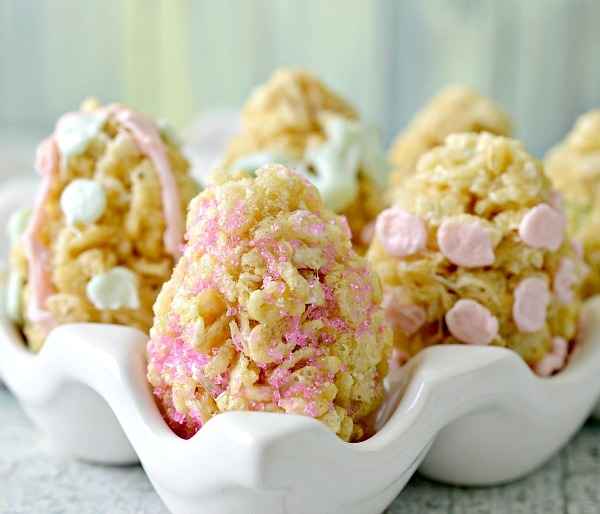 Makes about 10 Easter Egg Krispie Treats. 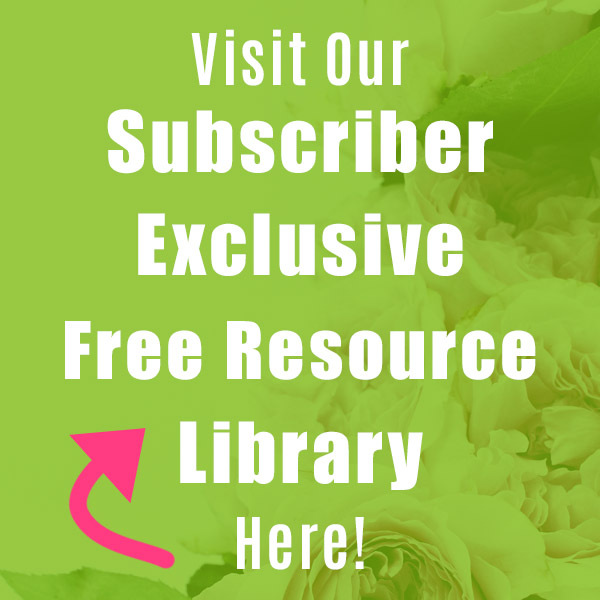 See, these are easy to make and they’re so pretty especially if you put them in a egg basket or egg crate! In a large bowl, place together the butter and mini marshmallows. 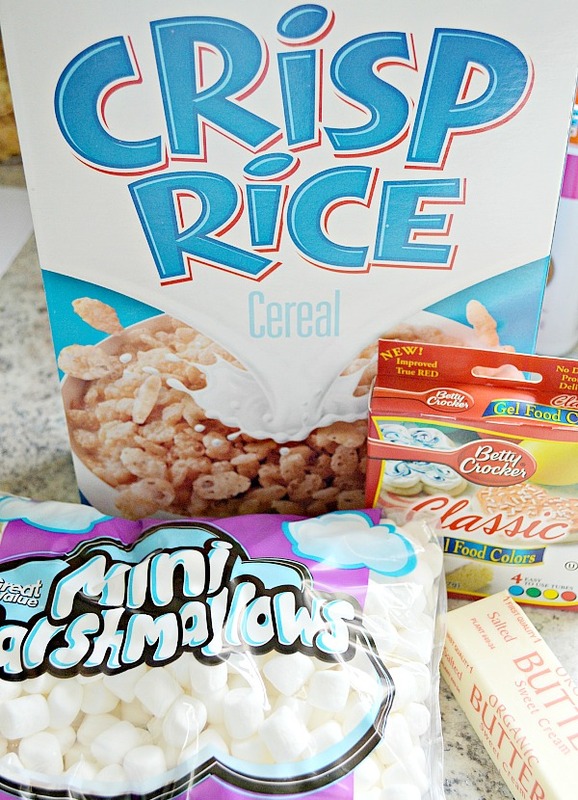 Microwave for 2 minutes or until the butter is melted and the marshmallows are puffy. Remove from the microwave and stir in the cereal. 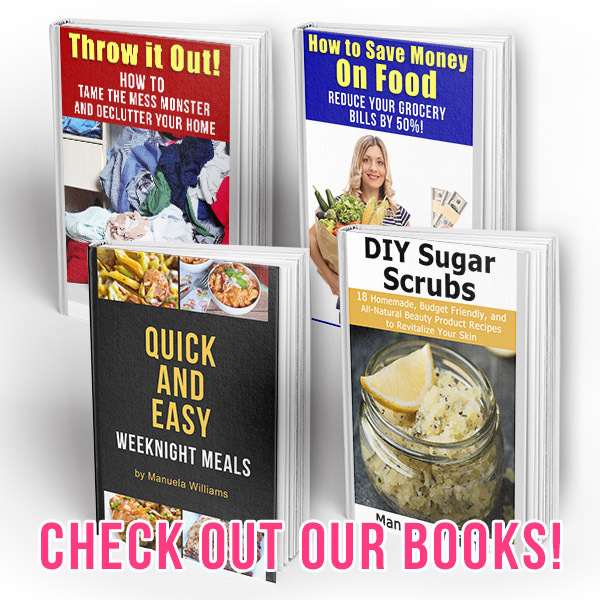 Let the mixture cool for one minute, place a bit of butter or baking grease on your hands and shape the cereal into egg shapes or spray the inside of a plastic snap-apart Easter egg and use that for a mold. If you want to decorate using some cute spring sprinkles, make sure to place the sprinkles while the marshmallow treat is still warm so they stick. To decorate with frosting, wait until your egg shapes have cooled for a few minutes and then get creative with your designs! 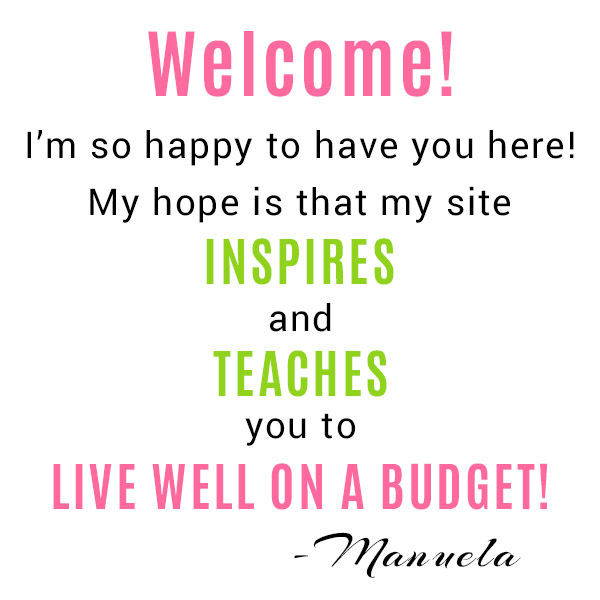 Popping in to comment since I’m using the computer today instead of the iPad! I told my daughter-in-law about the Lucky Charms treats. Unfortunately, on the day BEFORE St. Patrick’s Day. She teaches first grade and is always looking for cute ideas.